Xi’an the cradle of enigmatic and mesmerizing Chinese culture; and an erstwhile capital of the first dynasty of China offers the most astounding archaeological discovery of the 20th century – The Terracotta Army. The Terracotta Army on the outskirts of the city Xi’an holds an equal significance as that of The Great Wall of China or The Imperial Museum Palace. 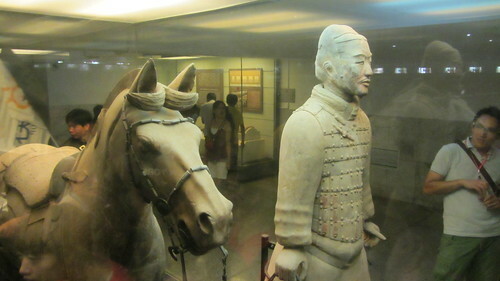 Built in 260-210 BC, the chief purpose of the Terracotta Army was to protect the crypt of the Emperor Qin Shihuang- the founder of the powerful Qin dynasty. Emperor Qin Shihuang was an influential and ruthless dictator who united China for the very first time. He ordered an army of 8000 life-size soldiers to be built and placed in an underground vault to safeguard his mausoleum. In 1974, the remarkable discovery of the terracotta army introduced the ancient Chinese culture and the Qin dynasty’s military organization. Standing tall at its authentic location, the astonishing monument reflects the history of the country’s erstwhile ruler. As the history tells, the pure intention of the Qin Shi Huang was to receive protection in his afterlife. Reigning in the 3rd century BC, the dictator commanded 700,000 workers to construct a terracotta army for his eternal sanctuary. He smothered the entire staff as soon as his tomb was completed, because he feared of the location being revealed. 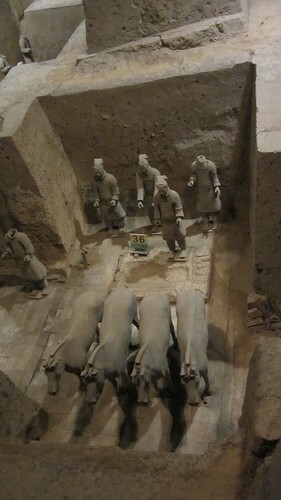 The discovery of the awe-inspiring Terracotta Army was made in the spring of 1974 by a group of farmers digging a well. Today, the world’s most massive mausoleum draws over 2 million tourists annually. The historians believe an army of 8000 soldiers and 150 cavalry horses, lies buried in the vault, and perhaps some more are still hidden. With the passage of time, these life-sized terracotta soldiers have faded in colour, yet their exuberance continue to shine. So far, only one warrior has been unearthed completely intact, and each warrior may take up to three restorers per year to meticulously fit the puzzle. The public at the site can view three excavated pits and they resemble the airplane hangers as if to preserve the warriors. The largest pit contains 6000 soldiers. In the similar spine-tingling sensation of visiting the Egypt’s pyramids, the Terracotta Army of Xi’an makes us travel back in time. Imagining artisans consumed neck-deep in their work and the workers carting the terracotta warriors into position, is not difficult at all. You can get closest to the army by admiring the dress and even the shoes embroidered with intricate patterns of the four of the best conserved warriors standing in the glass casings, away from the pits. Since the excavation and discovery is a continuous and ongoing process, the mausoleum appears to be more alike a breathing museum. Perhaps, when you visit Xi’an the next time, you may discover a new pit that contains a team of dancers and acrobats, for the emperor’s afterlife entertainment. Nonetheless, it seems that most of the discovery would remain untouched, because as the legend tells, the wealth of the kingdom is protected by the rivers of mercury and concealed traps. It seems the legend is true as the recent scientific analysis discovered high levels of mercury in the soil. 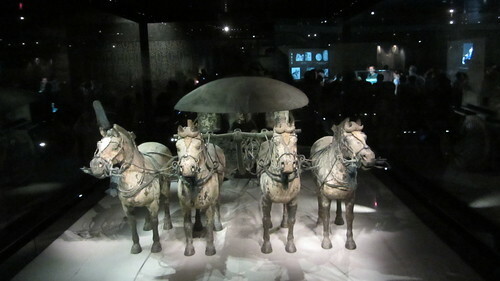 The museum enshrines a striking bronze chariot with horses, and interesting regalia like weapons and bronze vessels. 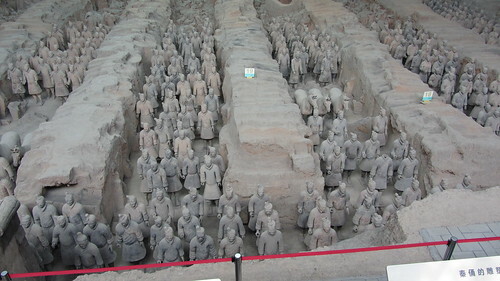 The material employed to create the terracotta soldiers originated on Mount Li. Each body part was separately made and then assembled. When visiting the city of Xi’an or the museum itself you will find several vendors who sell miniature terracotta soldiers, trinkets, jade bracelets and postcards of Terracotta Army. Be prepared to haggle and purchase souvenirs of the ancient times to display it on your walls when you return home. You arrive at the Guangzhou airport and then take another flight to Xi’an. It will take you 2hours and 30minutes to arrive at Xi’an. 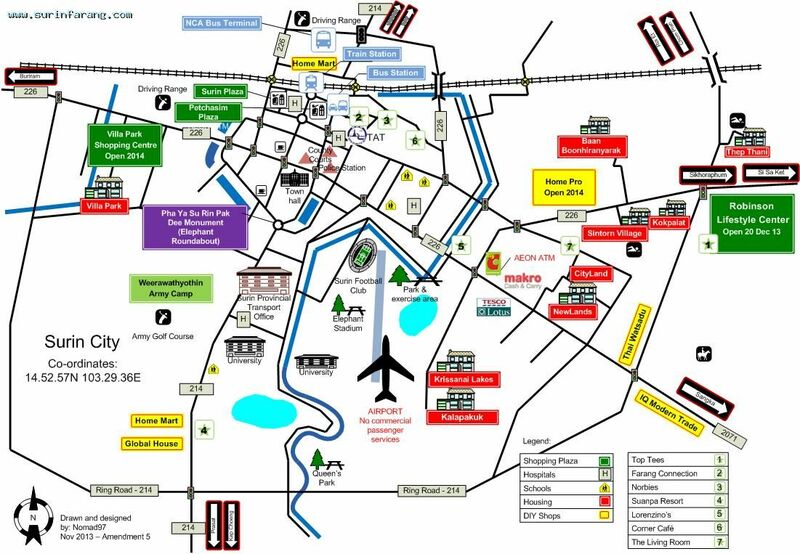 From the Xi’an airport take a bus ride, taxi or train to reach the historical site. 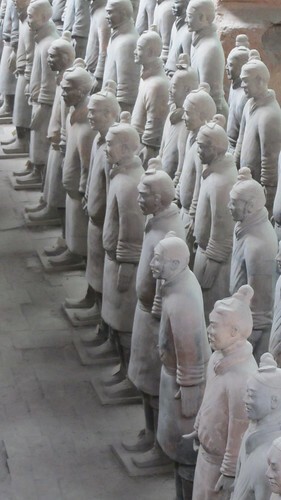 You may even insist your tour operator to arrange for a tour to the Terracotta Army location. The historical site remains open for tourists from 16th March- 14th November from 8.30AM-5.30PM. From 15th November – 15th March the visiting hours change, i.e. you can visit between 8.30AM-5:00 PM. The entry fee is $17.23 (110 Yuan).